← Let the Destashification Begin! A table runner ..and plans for so much more. It was so much fun!….and I estimate I used at least 15 yards of my stash! This is the first quilt, a One Block Wonder. The fabric is Celtic Illumination and was actually two celtic knot pillow tops, which can be seen on the left side of the picture. It is for my son who moved into a new apartment. Love the colors! It was a great deal of fun to make. I just wanted to try the cubes and enjoyed them as well. I may make a cubed quilt! These pictures were all taken prior to the quilt being sent to Long Arm Quilter. More pictures after it returns! 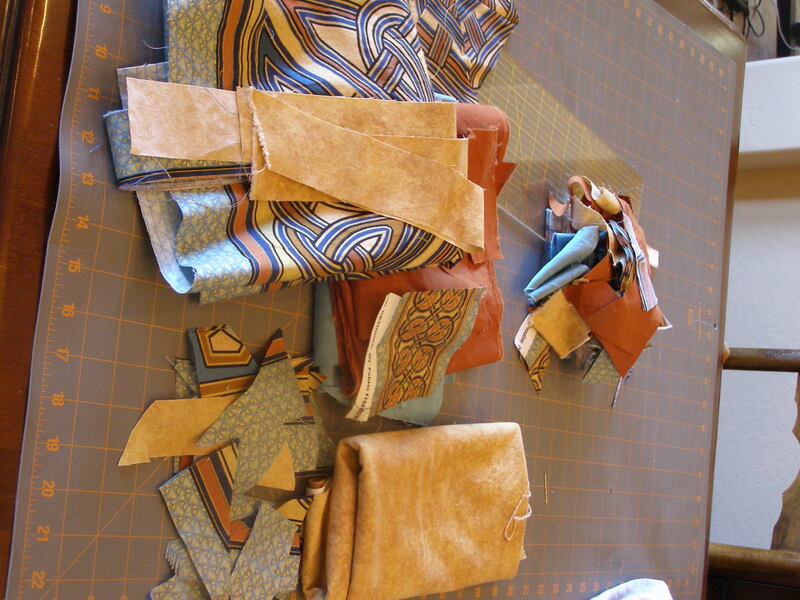 Every project creates more scraps for the Scrap Stash! Every project creates more scraps for the stash! The small pile on the far right were deemed too small for saving. The remainder wait for the next destashification inspiration! 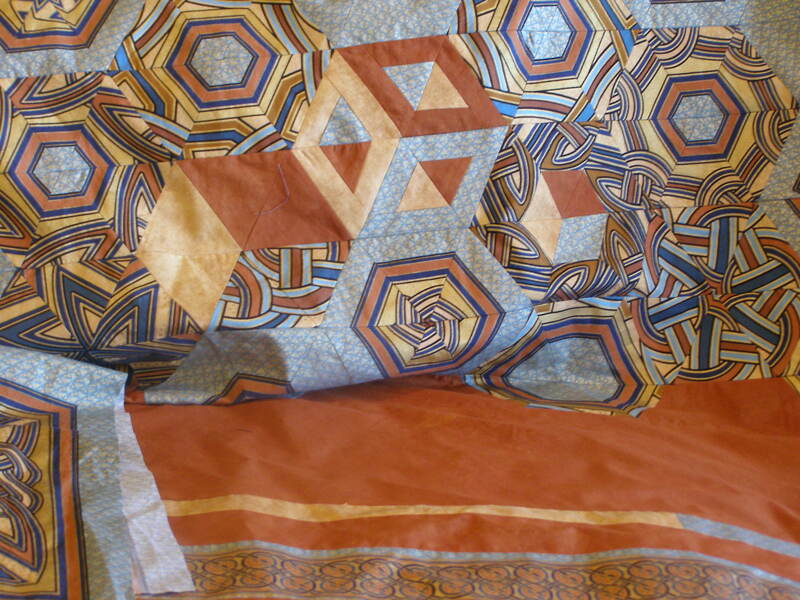 The second quilt was a New York Beauty Quilt. If there ever was a Destashification Project – it is a New York Beauty Quilt! Pieces of every size! 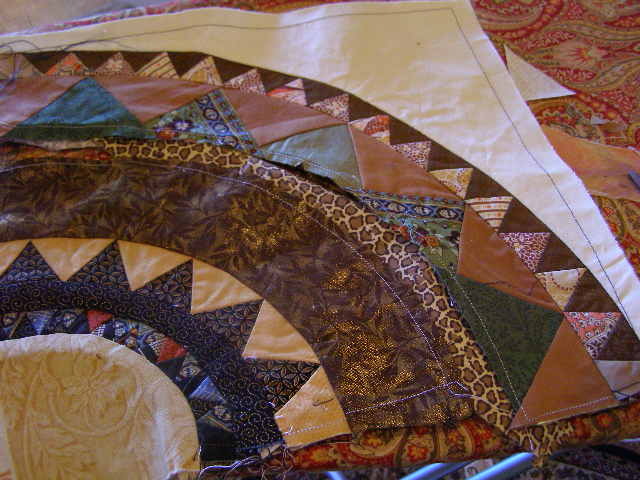 The outermost ring of light-colored triangles were cut from fabrics that belonged to my grandmother. This picture was taken as I was trying to decide what fabric to use to form the “missing ring”. It was great fun to see how the colors blended or contrasted to develop into blocks for this quilt. This quilt is also at the Long Arm Quilter. Can’t wait for its return! I don’t have any pictures of the other projects.. will post as soon as I do! 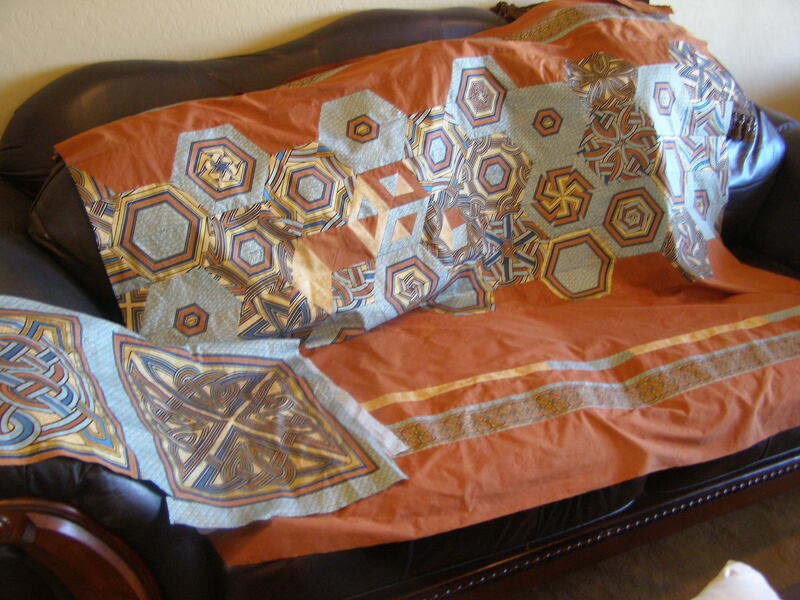 This entry was posted in New York Beauty, One Block Wonder, Quilting, Stash Couture. Bookmark the permalink. Wow, both your quilts are beautiful. And how wonderful that you have some of your grandmother’s scraps. The quilts that have those pieces will always be so special. I am truly blessed to be derived from the sewing lineage that was created by the women in my mother’s family. Each small and even tiny scrap of fabric I have inherited has been saved for “just the right” pattern. The New York Beauty had half-rings of 1/2″ triangles. I used many of the tiny pieces there. I am hoping to someday put together a 1″ square (finished size) postage stamp quilt that will accommodate many of the other tiny scraps of various colors. I love your patchwork – so precise and so neat. The material Celtic Illumination is very striking. Do you know perhaps who manufactures it? From what I could gather, Celtic Illumination was Designed by Fabric Freedom of the UK 5 or 6 years ago for Benartex. The following link is a pdf that contains a quilt pattern, but the first page shows some of the additional colorways for Celtic Illumination – which are all gorgeous! If I wasn’t on a Destashification Mission, I might purchase more of this beautiful fabric! It is sooooo tempting!